A leaky faucet wastes water and can be indicative of a more serious problem. We’ve all heard the dreaded drip coming from the bathroom before, whether it’s the middle of the night or in the morning when you get ready for work. If your faucet is leaking, the problem might be an easy fix or necessitate a total replacement. Here are the four most common causes of a leaking faucet. 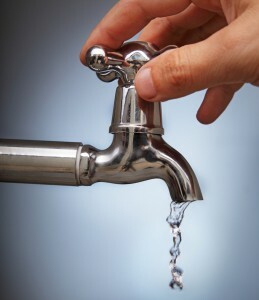 Damaged parts within a faucet is the most common cause of a leaking faucet. Is your faucet steadily dripping? It’s a sign that you need to replace the washer inside of the faucet tap. Do you have a compression faucet? The seals are very likely to become damaged over time, since they undergo large amounts of pressure every day. Other types of faucets, like cartridge or drip and ball faucets, might still have moving part issues with things like the seals or O-rings. If you have a cartridge faucet, the leaking might come from the cartridge itself. If you can find a matching cartridge for your model of sink, fixing the leak is a simple as swapping the new one in. Make sure that you measure the cartridge before swapping it out to make sure it’ll do the trick. Does your faucet leak at certain times of the day or only when you do certain things? The water pressure might be too high! High water pressure can stop water from flowing away, so it eventually backs up and has to leak out somewhere else, like a faucet or the toilet tank. This leaking is not an urgent issue but might be worth investigating nonetheless. This is not an incredibly common cause of a leaking faucet, but it is occasionally the culprit. Damaged pipes or fittings can cause cracks and then leak out. The crack might alter the water pressure and cause a leaking faucet. Give Master Plumbing a call at (301) 650-9100 or contact us online to get more information on how our expert plumbers can help you with your leaking faucet (or just about anything else plumbing related!). We have received Angie’s List Super Service Award recognition for plumbing and drain cleaning every year since 2007, in addition to the Best Plumber award from Best of Bethesda. We are fully licensed, bonded, and insured and our service is unparalleled. Give us a call today—you won’t regret it! To see examples of our projects, follow us on Facebook, Twitter, and Pinterest. This entry was posted on Wednesday, March 22nd, 2017 at 8:32 pm. Both comments and pings are currently closed.